Innovative machinery from around the world will be on display at IMTS. 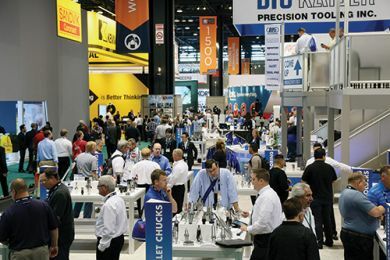 Key to maximizing the efficiency and effectiveness of those machines are the tooling and workholding products on display in the West Building at McCormick Place. "For every machine innovation, you'll find a corresponding tooling and workholding technology advance at IMTS 2016," says Jack Burley, Vice President, Sales and Engineering, BIG Kaiser Precision Tooling Inc., Hoffman Estates, Illinois. "For example, this year you'll see the introduction of smart tooling that uses Bluetooth technology. Everyone has a smart phone on their hip, so why not develop apps that enable supervisors to wirelessly check tooling status and operators to download installation instructions and parameter settings? "IMTS 2016 showcases specialized providers with core competencies in unique areas," says Peter R. Eelman, Vice President -- Exhibitions & Business Development, AMT -- The Association for Manufacturing Technology, the parent organization of IMTS. "By focusing intensely on one thing and doing it exceedingly well, tool and work holding companies develop products and technologies that take machine performance and accuracy to new levels." With spindle speeds double what they were 10 years ago (now 20,000+ rpm), look for more tool holding technologies which are stronger, more rigid and capable of running at higher speeds without unwanted vibration. The real speed issue, however, relates to tooling and workholding that reduces set-up and cycle time. "Customers want products that are ready-to-use out of the box," says Burley. "Further, they expect the same results whether a 20-year veteran or a recent graduate installs the tooling. That's why you see tools with a digital display instead of an analog dial. It removes one source of potential error." Like it or not, mere human involvement can introduce more variables than it eliminates. As a result, tool and workholding suppliers have more recently focused on automation. Whether at IMTS 2016 or soon thereafter, expect fully automated tool change solutions that enable companies to shift human capital to where it adds more value. Specifically on the workholding side, Burley sees a focus on flexible systems that allow multiple part configuration set ups, accommodate multiple platforms and, of course, set up quickly and with repeatable accuracy. "Workholding shouldn't be considered just for cutting," he adds. "It should follow the part through the whole process, and that includes gauging and inspection. Keeping a common datum throughout the process makes checking and inspection much more efficient, as requalifying is a painstaking process that increases cycle time." "The trends you see in the other pavilions are mirrored in the Tooling & Workholding Pavilion," notes Eelman. "Look for solutions with greater connectivity, that address the issues of an aging and changing workforce and accommodate manufacturing facilities that want to run lights-out."